Combine the alpine thrill of ziplining across the Continental Divide with Top of the Rockies Zipline at Fremont Pass, a trip through historic Leadville for lunch on your own, and then onto Buena Vista for a rafting trip through Browns Canyon, one of the most popular and scenic rivers in the country. 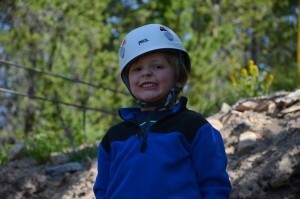 Ask about combining a zip tour with any of our Arkansas River rafting trips! 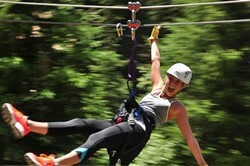 Departure Location/Time: Top of the Rockies Zip Line 9:30 a.m.
One of the World’s Most Popular Whitewater Rafting Trips! This is a great trip for families and individuals alike. Offering unbelievable Rocky Mountain scenery and classic rapids such as Pinball, Zoom Flume and Widowmaker, these trips offer the perfect mix of whitewater, calm water and scenery. Full day trips run more rapids, including Sidell’s Suckhole and Twin Falls, and include a riverside lunch at one of the many great camp spots in the canyon. 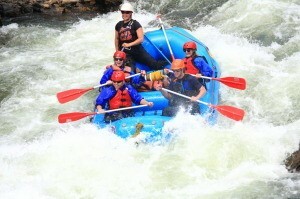 DEPARTURE PLACE/TIME: Arkansas River Outpost 9:30 a.m.
One of the World’s Most Popular Whitewater Rafting Trips! This is a great trip for families and individuals alike. Offering unbelievable Rocky Mountain scenery and classic rapids such as Pinball, Zoom Flume and Widowmaker, these trips offer the perfect mix of whitewater, calm water and scenery. 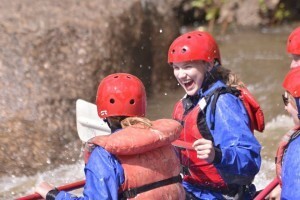 DEPARTURE PLACE/TIME: Arkansas River Outpost 8:45 a.m., 12:45 p.m. and 1:45 p.m.
PRICE: $69 adults/$65 children 12 & under. Departure Place/Time: Arkansas River Outpost at 9:00 a.m. and 1:00 p.m.
Trip Description: Come and enjoy this half day class II-III 8 mile stretch on the Arkansas River. This trip is a mixture of big meandering turns and a couple of introductory splashy rapids. It is very scenic passing through farm land, open space, and forests. It is an 8 mile stretch that ends up in the town of Salida. This section is a great alternative if you have young children or are looking for a scenic, mild float. Combine this trip with our Duckies to try your skills in your own boat and add a little more adventure for the thrill-seeker in your party! MINIMUM AGE: 3 years and 30 lbs. PRICE: $67 adults/$59 children 12 & under. DEPARTURE PLACE/TIME: Arkansas River Outpost 9:00 a.m. and 1:00 p.m.
Trip Description: The same as the Big Bend Half Day, but with a twist! Duckies are a great way to experience the thrill of maneuvering your own “boat” down the river. Inflatable one- or two-person kayaks, duckies give you the opportunity to guide your own craft. A great option for those looking for a little more adventure. 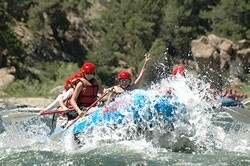 This is our Browns Canyon 1/2 Day Raft Trip with a twist! Experience Browns Canyon National Monument as never before, in a 9 foot raft. These boats hold a capacity of three boaters (including the guide). You will be sitting in the seat of adventure for this trip. This is a high adventure trip, so plan on getting wet! Combine the best of both worlds! Raft both the Numbers and Brown’s Canyon National Monument in a single, thrilling day! 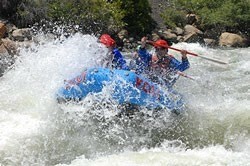 This trip takes guests through the Miracle Mile and technical rapids, such as House Rock and Frog Rock. A riverside lunch will be followed with classic rapids such as Pinball, Zoom Flume and Widowmaker. Offering unbelievable Rocky Mountain scenery and this trip offers the perfect mix of whitewater and scenery. Be prepared for a challenging day on the water. Previous paddling experience recommended. DEPARTURE PLACE/TIME: Arkansas River Outpost 9:00 a.m.
After a picnic lunch you will launch from the town of Buena Vista, where you’ll immediately hit Beaver Falls and the Silver Bullet (class III), then continue down into Browns Canyon, where you’ll camp for the night. Dinner will consist of chips, salsa, fajita’s with all the fixin’s and dessert. Following a hearty breakfast of french toast, bacon and fresh fruit, we’ll head down the river further into the Canyon. You will encounter all the classic rapids such as Zoom Floom, The Staircase, and Sidells Suckhole on day two. KODI’s cheese tortellini lunch will be served alongside the river, and you’ll continue down to the take-out at Stone Bridge. Take-out time will be approximately 3:00 p.m. The Numbers is a trip for aggressive paddlers only. Seven rapids in seven miles of continuous Class III-IV rapids challenge even our most physically fit guests. 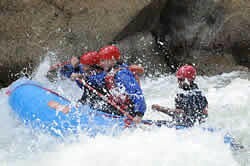 This trip takes guests through the Miracle Mile and technical rapids, such as House Rock and Frog Rock. Previous paddling experience recommended. DEPARTURE PLACE/TIME: Arkansas River Outpost 10:00 a.m. The Numbers is a trip for aggressive paddlers only. 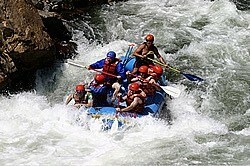 Seven rapids in seven miles of continuous Class III-V rapids challenge even our most physically fit guests. Previous paddling experience recommended. 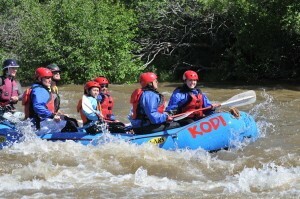 KODI Rafting is now offering “private”, all-inclusive trips on the Arkansas River. 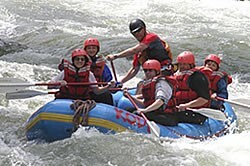 Enjoy the luxury, convenience and personalized service of a private rafting trip. We can launch anytime between 9:00 am and 3:00 pm for Browns Canyon and between 9:00 am and 2:00 pm for the Numbers. When you call to book your Exclusive River Adventure, you’ll tell us when you would like to be picked up, when you would like to put on the river and what you would like for lunch. We have a variety of delicious and innovative food options for you to choose from. Transportation will be provided to and from Summit and Eagle Counties for your convenience. You will also receive a digital download of professional photos taken at one of the great rapids on the river. Your trip will be exclusive to you and your group, and is perfect for that special birthday, anniversary or celebration. DEPARTURE PLACE/TIME: You tell us where and when you would like us to pick you up and we’ll be there. The Blue River starts atop Hoosier Pass on the South side of Breckenridge and works its way into Dillon Reservoir. From there the Blue River is released north and joins the Colorado River near Kremmling, Colorado. But, well upstream of the confluence are the rapids of Boulder Canyon and great fun to be had. This is what we like to call a quick hitter kind of trip, providing about an hour of on river time. Another advantage of this raft trip is that it is only minutes from Frisco, Breckenridge and Dillon and our put-in is just downstream from Silverthorne, right here in Summit County. The perfect river trip, mixing 3 miles of calm float, and 3 miles of fantastic class II-III whitewater. Put those together and that equals 6 miles of spectacular Rocky Mountain Scenery, and a short trip that covers all the bases! The Blue River is dependent on our great snowpack and is usually an early season run, but that doesn’t mean we haven’t or don’t run it late in the season, so be sure to give a reservations specialist a call for up to date status regarding Blue River water levels. Blue River whitewater raft trips all leave from the Summit County Outpost in Frisco, CO.
DEPARTURE PLACE/TIME: Summit County Outpost 9:00 a.m., 12:00 p.m. and 3:00 p.m. This trip will meet at 9:00 a.m. at Top of the Rockies Zip Line located between Frisco and Leadville near the Summit of Fremont Pass. Plan to spend approximately two hours on this exciting tour. After check-in at the Base Camp at their 2,500 acre Private Preserve, board a 6 ton MONSTER TRUCK for a ride up through the forest to the first zip line departure platform at 11,200 feet. From here you’ll enjoy spectacular panoramic views of Mt. Elbert and Mt. Massive, two of the tallest peaks in North America from the deck of the Yurt. See some of the old historic patented gold mines on the property as well as possible wildlife. Fly side by side experiencing different elements of speed, distance off the ground, and terrain on each of the SIX SEPARATE ZIP LINE SECTIONS. Stop at one of the bubbling streams in the area for cold drinks and snacks. A shuttle vehicle will return you to Base Camp at the end of your tour. After your Zip Line experience, you’ll make your way to the town of Frisco, CO where you can enjoy lunch on your own at one of the many fine restaurants. 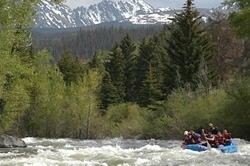 After lunch, meet us at our Summit County Outpost in Frisco for your Blue River Rafting trip. This is what we like to call a quick hitter kind of trip, providing about an hour of on river time and is just minutes from Frisco, Breckenridge, Dillon and Silverthorne. The perfect river trip, mixing 3 miles of calm float, and 3 miles of fantastic class II-III whitewater. DEPARTURE PLACE/TIME: Departure times can vary depending on availability. The whitewater rafting on Clear Creek is some of the best in Colorado, and it’s only 30 minutes from most locations in and around Denver and Summit County! Rich in mining history, Clear Creek runs adjacent to I-70 and through the quaint mining town of Idaho Springs where the stories of gold and silver mining run up and down the canyon, from Georgetown and Silver Plume to Blackhawk, Central City and Golden. Clear Creek’s central location makes it easy to grab a quick river fix if you are traveling to or from Denver International Airport. 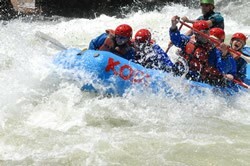 KODI Rafting offers three great trips on Clear Creek offering a wide variety of options from a quick 1/3 day Class II-III option to a steep and narrow plunge down Class IV rapids like Meat and Beef and Lumpy’s. All of KODI Rafting’s guided whitewater raft trips on Clear Creek leave from our Clear Creek Outpost in Idaho Springs, Colorado. Action-packed whitewater trips just minutes from Denver for experienced paddlers or those with a true sense of adventure. This trip will start out with Meat-n-Beef and Lumpys, and continue with thrilling whitewater. 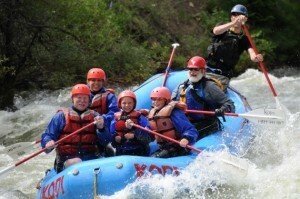 This trips offer continuous whitewater, from Class II-IV, before taking out in the historic mining town of Idaho Springs. Wetsuits are included on this trip. DEPARTURE PLACE/TIME: Clear Creek Outpost 3:00 p.m. This trip will start out with a short stretch of some Class II-II+ water to warm up your paddling muscles before you start your whitewater experience with Rodeo. Before you know it you’ll have navigated No Mad, Fall River, Deliverance and Outer-Limits to name a few. 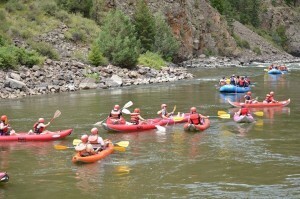 You’ll then be able to enjoy the float through the historic mining town of Idaho Springs. Wetsuits are included on this trip. DEPARTURE PLACE/TIME: Clear Creek Outpost 12:00 p.m. and 3:00 p.m.
Great for families and beginners alike, this trip, just minutes from Denver, takes you through the historic mining town of Idaho Springs on a continuous Class II-III adventure. Wetsuits are included on this trip. DEPARTURE PLACE/TIME: Clear Creek Outpost 9:00 a.m.
From here you’ll enjoy spectacular panoramic views of Mt. Elbert and Mt. Massive, two of the tallest peaks in North America from the deck of the Yurt. See some of the old historic patented gold mines on the property as well as possible wildlife. Fly side by side experiencing different elements of speed, distance off the ground, and terrain on each of the FIVE SEPARATE ZIP LINE SECTIONS. Stop at one of the bubbling streams in the area for cold drinks and snacks. A shuttle vehicle will return you to Base Camp at the end of your tour. After your Zip Line experience, you’ll make your way through Leadville to our Arkansas River Outpost where you’ll be able to enjoy a gourmet sandwich lunch amongst the towering 14,000 foot peaks near Buena Vista. After a leisurely lunch we’ll be gearing you up for our Browns Canyon National Monument ½ day. 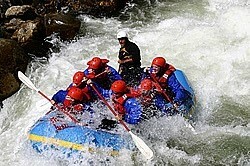 This is one of the World’s Most Popular Whitewater Rafting Trips! This is a great trip for families and individuals alike. Offering unbelievable Rocky Mountain scenery and classic rapids such as Pinball, Zoom Flume and Widowmaker, these trips offer the perfect mix of whitewater, calm water and scenery. This trip will depart our Arkansas River Outpost at 12:45 pm and return to our Outpost around 4:00 – 4:30 pm. DEPARTURE PLACE/TIME: Top of the Rockies Zip Line 9:30 a.m..
DEPARTURE PLACE/TIME: This trip is fully customized based on your needs! TRIP DESCRIPTION: The Best of Both Worlds! Pair any of our rafting trips with a horseback ride in the Rockies with Colorado’s finest outfitter! Make a full day of your adventure, or break it up throughout your stay, we will help you decide. 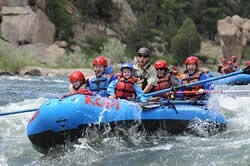 Top off that scenic Rocky mountain Ride with a raft trip with a family float down the beautiful Colorado River through one of the most historic and scenic canyons in the country, or choose a wet and wild raft trip on Brown’s Canyon, the Blue River or even Clear Creek. PRE-BOOK YOUR SUMMER ACTIVITIES NOW!